On the August 3rd of 1914, Germany declared war on France, just two days after declaring war on Russia. Germany prepared to begin the Schlieffen plan, which mapped out Germany's actions in the two-front war against France and Russia. Several hours later, France made its own declaration of war, and began moving troops into Alsace and Lorraine, provinces it had lost to Germany in the Franco-Prussian war. This declaration of war on France turned Germany's war into a World War. Before declaring war on France, the war was just another conflict in the Balkans, but when France entered the arena, the world would be forced to join. 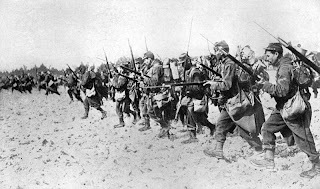 The Schlieffen plan called for German forces to invade France by passing through Belgium. Since 1939, France and Britain had guaranteed Belgium's neutrality in any wars, so when the plan to invade France was initiated, not only France would get involved, but Belgium, Britain, and any territories belonging to these nations, which, at this point, included India, Vietnam, parts of Africa, and even parts of China and the Pacific islands. At the time they were unaware, but this war would become the largest war the world had ever seen.